Superman’s had a rough time in his comics lately: his most recent problem being that he’s about to die (for real!). As we await Superman’s impending death, now is a great time to look back and see how DC marked the passing of the Man of Steel the last time it happened—in one of the biggest events in comics history. Last week, for the first time since its original printing over twenty years ago, DC released a digital version of the special edition of Newstime that was published in the wake of 1993's Death of Superman arc, which saw Superman perish at the hands of Doomsday once and for all. 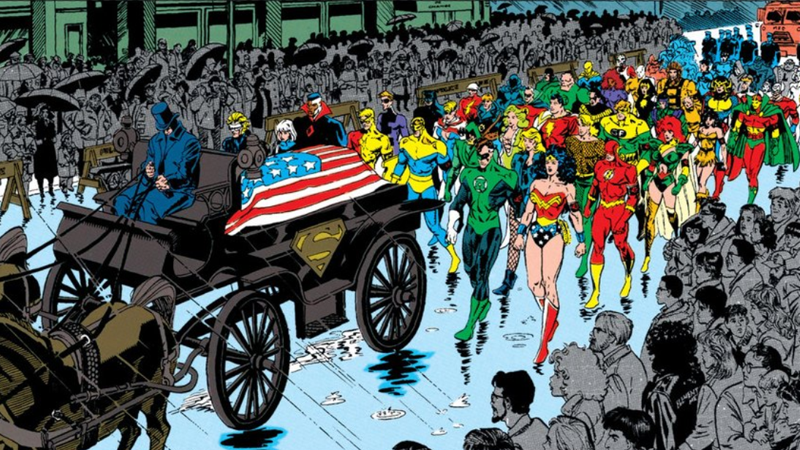 Considering everything going on with Superman on the big screen and in the comics right now, it’s fascinating to go back and see how DC commemorated the death of its most iconic hero. It’s also rather complicated. The storyline referred to as The Death of Superman is usually given as a catch all term to refer to a trilogy of arcs that began in October 1992 with Doomsday!, continued with Funeral for a Friend, and then concluded in October 1993 at the end of Reign of the Supermen! The saga saw Superman face the ancient Kryptonian supervillain Doomsday for the first time—a battle that saw both the Man of Steel and Doomsday perish seemingly for good, while the world tried to cope with a reality in which Superman was no more. Comic books being comic books, though, Superman got better and made his triumphant return after various other heroes had tried to become Superman in his stead in. But when it happened, Superman’s death was a monumental event—both within the comics world and our own. Dan Jurgens, Roger Stern, Louise Simonson, Jerry Ordway, and Karl Kesel’s shocking story in the pages of Superman was making international news, and as copies of comics were selling out everywhere, DC capitalized on the attention with the aforementioned special edition of Newstime. Written as if it was a real publication—but actually written by the Superman creative team, with art from a plethora of DC artists acting as “photographs” from the scene—Newstime: The Life and Death of The Man of Steel features a plethora of reactions to Superman’s death from the DC universe. The special issue, released in May 1993 at the height of the Death of Superman, includes fictional reports on the climactic battle between Superman and Doomsday as well as explainers on who Doomsday really was and where the villain had come from. There’s also coverage from Superman’s funeral and editorial pieces lamenting the loss of the hero. Sandwiched between the longer pieces are faux “letters to the Editors” columns and adverts for DC products and companies like WayneTech, Big Belly Burger, or Coast City’s Ferris aircraft. The magazine is a bizarrely cyclical take on a major comic book event—from the pages of a comic, to real-life international news, and back into a “comic” through the lens of news reporting. But the death of Superman was an event that earned this sort of commemoration, a reflection of just how iconic a character Superman was and how he reached across the world and touched the hearts of millions. The mix of absurdity and melancholy that readers must have when flipping through the faux news “magazine” years ago perfectly encapsulated what was, at the time, a mind-blowing event. Comic book character death might have been as cliché a plot device in 1993 as it is today, but this was Superman. An untouchable hero had been laid low. Yet, this special issue of Newstime also reads as completely absurd. One minute, you’re reading a blow-by-blow analysis of how the Justice League will live on without its most iconic member; the next, it’s a series of fictional reviews of “upcoming” movies and music releases. Most hilarious of these fake reviews is a particularly scathing diatribe on superhero thriller Courageous Man Strikes Back, which lambasts the fake sequel for favoring special effects over story telling in a thinly-veiled pastiche of Batman Returns critiques. (The review even bemoans how Courageous Man’s brand-new animated series was doing a much better job of portraying the hero than the new movie—sound familiar?) On the page before it is a short blurb on how noted journalist and novelist Clark Kent is still missing. Sometimes you even got that tonal dissonance in the same “article.” A collection of quotes from famous figures reacting to Superman’s passing, for example, includes everyone from noted businessman Bruce Wayne, Wonder Woman, and Daily Planet columnist Cat Grant, to reactions from actual public figures like William Shatner, Ringworld writer Larry Niven, and Shaquille O’Neal. Yes, now you know what Shaq would’ve said if Superman was a) real and b) had died. It’s so weird. But it’s also great that this strange artifact in one of the most defining moments of DC comics history is now preserved digitally for people to enjoy, all these years later.